OUR WORLD IS ON INFORMATION OVERLOAD. We are inundated with news and visuals via social media, on our TVs, radios, computers and smartphones. We are on constant alert and in CONSTANT CONTACT. Each of us has developed filters to try and CONTROL THE BARRAGE OF INFORMATION, but it is difficult to manage when all forms of diverging interests spend trillions to keep us tuned in. MARKETING IS OMNIPRESENT with the sole goal to MANIPULATE and convince us of the necessity of a product, honesty of a person, or voracity of an idea. As a child of the sixties I see all of this visual and mental stimulus putting us into a kind of “INFORMATION SHOCK.” WE CAN’T PROCESS everything happening around us, so we try to tune it out, and it’s not always easy. LIMITING INTAKE and managing understanding, hashing out the relevant from the firewall of BS can take a lot of energy. Meditation and mindfulness in a world SUPERCHARGED WITH DISTRACTIONS is a growing challenge. But it is MINDFULNESS AND MEDITATION with an equal dose of EMPATHY that can help us deal with this changing world and LOOK CLOSER! Alternative facts or different perspectives on the truth can and are certainly used to cloud the information we are receiving. I would argue that alternatives to what is commonly believed are also what moves civilization forward. Looking at this from the perspective of an artist I see the varying realities make the conversation difficult. But we all have particular views. Artists, poets, philosophers, scientists, cab drivers have unique incites into the things they care about. Each of us brings our own history, ethnicity, race, religion, and upbringing that filters our individual perspectives. Asking questions about events helps us be objective. Being curious about others deepens our understanding of ourselves and our peers. Respecting various versions of “the truth” can only strengthens communication in our communities. Accepting differences will help all of us become better, more productive members of society. The art in this show is not political, it is personal. Each piece is singular. But it speaks of the artist’s viewpoint and in turn, will communicate different things to different people. IT RESONATES OR IT DOESN’T to new eyes and CHANGES AT SECOND GLANCE. So, is art a lie as Picasso puts it? In an ironic twist, all but a few of the artists rejected that notion! One of the artists found a better analogy in the writings of James Baldwin – “THE PURPOSE OF ART IS TO LAY BARE THE QUESTIONS HIDDEN BY THE ANSWERS.” Certainly a more artful way of saying it. For in the answers are always more questions. THAT IS THE HUMAN CONDITION: We know little yet learn more every second. It’s in the asking that our knowledge grows and through doubts we expand the evidence, bringing us closer to the answers. Or maybe it’s beyond explanation? Artists are affected by what happens around them. Maybe their art is done to cope, or escape or understand that? Their expressions are their own, put out in the world to be ingested by anyone who’s willing. Filtered through another’s perspective and changing but not negating the artist’s intention. The original still exists and is understood or misunderstood ad infinitum. The idea, though, that was it’s main purpose does not cease to be, it’s innate. The art I make is cathartic. It’s fulfilling. It is an alternative expression of myself; everything I’ve learned, experienced or dreamed played a part in its creation. It’s personal and only. When someone responds to it, they are bringing their own experiences, dreams, intelligence to it but I am in there too. And that’s where alternative facts can lead us. Always LOOK CLOSER! ALWAYS ASK QUESTIONS. ALWAYS DOUBT WHAT YOU THINK YOU KNOW, ESPECIALLY WHEN YOU’RE POSITIVE. TRUST YOURSELF BUT REMEMBER THAT INTRANSIGENCE IS A FLAW. LISTEN MORE THAN YOU SPEAK. PAY ATTENTION WHENEVER POSSIBLE. LOVE YOURSELF, FORGIVE YOURSELF, MAKE MISTAKES AND ENJOY IT! ACCEPT ALTERnative REALities BUT NEVER STOP QUESTIONING AUTHORity! Pleiades Reception was a blast! To change, substitute or replace what’s inherent and indisputable about someone or something. Ex. : The clumsy, incompetent political hack told the reporter that the lie she had just told was not a lie but an alternative fact. A tool that the inquisitive minded use to deepen the integrity of human understanding. To open perceptions beyond the limits of experience. Ex. : Before Pythagoras theorized the Earth was a sphere, it was considered an alternative fact to the idea that the Earth was flat or saucer shaped. facts, we love them. We search for them. Picasso famously pointed out “We all know that art is not truth. Art is a lie… The artist must know the manner whereby to convince others of the truthfulness of his lies.” Cindy Sherman manipulates her identity. Ai Weiwei asks in “According to What?” that we destroy a piece of his art. Taken separately, each part of the title: alter; native; facts, creates a clearer picture of why artists cultivate this ability and the sum is greater than any of the parts. Our alternative perceptions create a dialogue with the past, the present and the future. We are at our best when we are doubting the indisputable, seeing the significance of irrelevance, and finding evidence where none existed – changing in a small but significant way what is accepted as true. The Alter(native) Facts Exhibit is a call for art that convinces us to believe the lie and be happy about it. Attended Buffalo State University for 2 years where she studied printmaking. Graduated from Hofstra University with a degree in Fine Arts and design. She has two published books “Parallel Spell: 7 pictures 7 poems” in collaboration with the poet and writer Elena Alexander. And “Symbols” the companion book to her 2017 solo show of the same name that ran at Pleiades Gallery, April/May 2017. Fifteen of her street photographs are used as the backdrop in the production “Heart Meridians.” originally produced by DTW in NYC. She is a founding member of the Cultural Guerrillas group with the artist Mary Jones. 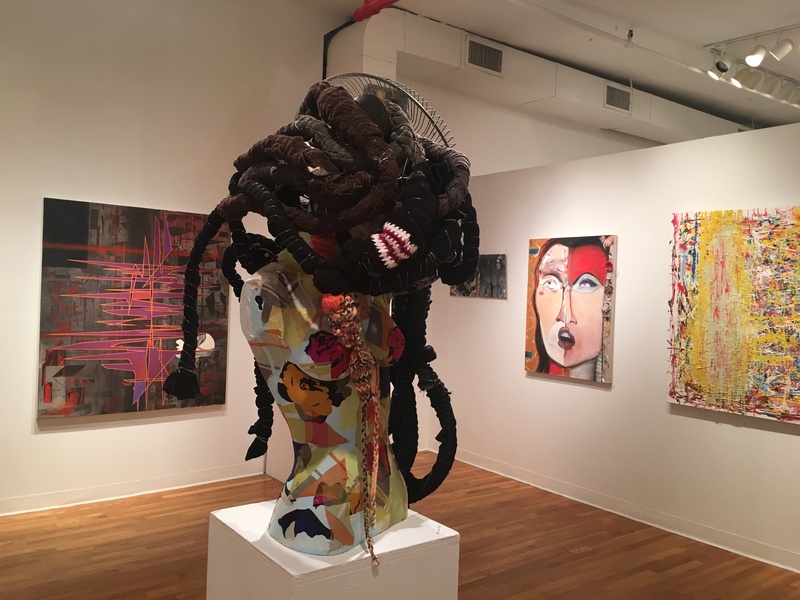 Their mission is to produce pop up shows with a variety of mixed media artists who are using visual rhetoric as expressions of alternative cultural meaning. She is a member of the Pleiades Gallery group on W 25th St. in Chelsea, NYC. She will have a two person show “Dialog” with Mary Jones in November 2017 at the Hudson Guild Gallery. Her work is shown regularly in group shows in NY and nationally.